Kate Aitken (April 6, 1891 – December 11, 1971) was a Canadian radio and television broadcaster in the 1930s, 1940s and 1950s. 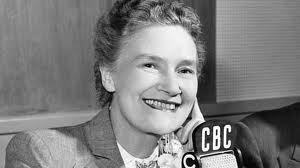 As Mrs. A, she was one of the most famous hosts on the Canadian Broadcasting Corporation in her era. Kate Aitken was born Kate Scott in Beeton, Ont. She taught school in Cypress Hills, Alta. Following her marriage to Henry M. Aitken in 1914, Aitken moved back to Ontario to run a poultry farm and fruit canning business. In 1923, Aitken became Director of Women’s Activities for the Canadian National Exhibition and conducted cooking schools for 29 years until 1952. In 1927, she attended the Imperial Wheat Conference for the Ontario Department of Agriculture. Aitken began full-time broadcasting for CFRB and later CBC, writing and producing a homemaking-general news show three times a day, five days a week for over 23 years. During World War II, Aitken was appointed Supervisor of Conservation for the Wartime Prices and Trade Board. Travelling across the country, “Mrs A” created her famous “Make over and make do” workshops designed to teach women to budget and conserve materials in short supply. As Food Editor for “The Standard” in 1945, Aitken travelled throughout Great Britain, Denmark and Norway doing a post-war food survey. She became a regular feature writer for the “Globe and Mail, “Chatelaine” and “Maclean’s”. She made five world tours to trouble areas such as Cyprus, Spain and Korea. In 1955, Aitken resigned from radio in order to devote more time to writing and lecturing. She wrote more than a dozen books on cooking, travel and etiquette and two autobiographies; “Never a Day so Bright” (1956), and “Making Your Living is Fun” (1959). In 1958, Aitken was appointed to the Board of Directors of the CBC and in 1959, was CBC representative to the Canadian National Commission for UNESCO. Aitken was National Secretary for the Federated Women’s Institute, President of the Toronto Women’s Press Club and belonged to several other clubs. Listen to one of Mrs. A’s broadcasts to get a feel of a 1940s radio show, and for a surprisingly contemporary comment on Canadian school readings. Click here.